I’d heard whisperings from afar that snow had fallen on Tarfala. Of course, there was little that I could do about it, but the anticipation of what I would return to was never far from my mind. Roped up, trekking up a snowy Storeglaciären, I was beginning to wonder whether Mike and I should have brought a couple of shovels. But as the glacier’s angle eased, it started to look like everything was all going to be just fine. Re-finding the site was easy, despite the snow; I’d left a huge pile of Rock-Socks, which had become a local sigh-seeing feature over the summer. Mike and I quickly got to work against the ever growing icy blasts of air. This was no place to hang around in. Our mission for the week was to sample and process late season microbial communities as much as possible in the little time that we had. Fortunately, strong winds, lashing rain and mild(ish) temperatures were soon to be on our side for assisting snow melt. I’d also managed to streamline our sampling regime so that we could be done and dusted at the glacial site in under an hour, to avoid the perils of freezing fingers and numb toes. Storeglaciären freezing-up for the year. As the week went on, the loss of snow assisted with our sampling, but it still felt like Tarfala had given up on summer for the year. Now that I’ve returned home, the weather forecasts keep showing the research station with sub-zero temperatures and snow; so I’m more than pleased that we managed to catch this end of season window. Calm after the storm(s): Glad for a wind-free day. Finally, all that was left to do was to clear up and pack out; which is where Mike really came into his own, with the dismantling of the Rock-Socks and helping to carry out all our kit. All in all, it’s been a funny sampling year for me. The research station even announced that Storeglaciären actually gained weight this year; something we don’t tend to expect these days. The staff at the station were fantastic, and I’m more that grateful to INTERACCESS for funding this trip. Here’s hoping that some great results follow suit. Cheers Tarfala! After a frustratingly snowy start to my time in Tarfala, the snow eventually turned to slush, and within days the glacier’s bare ice finally started to reveal itself. On July 11th, 11 days after arriving at Tarfala, and after a bout of gale force winds, I dashed up the hills on the other side of the valley to my glacial site to get an overview of the melt situation. Filled with excitement over what must surely be bare ice, I raced back down the hill, grabbed my sampling kit, and managed to take my first supraglacial samples from Storeglaciären!! A long day, but well worth it!! The benefits of taking a step back!! Bare ice patches on Storeglaciären revealing themselves on July 11th. From this point on, the next two and a half weeks became a non-stop carousel of hiking up the glacier to collect samples in the morning, then returning to the lab to process and analyze them in the afternoon and often into the evening. The glacier didn’t disappoint with its abundance of ice algae; so I was extremely happy with that. Despite it being a fairly exhausting schedule to be doing without assistance, I’m confident that I’ve got a great collection of samples in storage ready to take home now. The never ending filtering fun! Winter seemed to keep clinging on in the Tarfala valley. The winds were fierce at times and clouds and rain became no stranger to me. Thankfully, in the final week and a half of July, the sun shone and pushed summer along, and before I knew it I was skipping down the valley towards Nikkaluokta; the portal back to the real world, ready for my first return journey home. I’m now in the UK for a couple of weeks, but I’ll be back at the end of August to take more samples, conduct more experiments and finish up this INTERACT funded field work. The beautiful walk down the valley from Tarfala back towards civilization. I am on day four of ten at the Tarfala Research Station. I came here with intentions to collect tube after tube of cryoconite, gather up any biofilm samples I can and do some glacier forefield sampling. So far, thanks to a hefty layer of snow, I have achieved only one out of three and am losing hope of fulfilling the others; such is the nature of fieldwork. However, there is hope: after three days of sun it is currently raining (not snowing!) and we have spent the last two days digging for hours and hours to try and hurry things along so Karen can begin setting up her experiment. Thankfully there is a sauna to reward my aching back after all that shoveling, and tea breaks are spent shuffling/dancing to Ed Sheeran. Meanwhile, I have been collecting soil types from the glacier forefield, writing up sampling strategy, and filling socks with rocks (?!). Due to some dodgy scales at home, I packed extremely light, which at least means I can lug all these bags of soil home without too much back ache. Digging seems to be the theme of this trip, and I can report there has been a correlation between my mood and the temperature. Karen has been kind enough to assist me with this soil sampling, resulting in some very good, rather literal note taking: “Ooh, this soil is nice and… shovellable.” And “Bloody moss everywhere!” and photos that are much more interesting than I would usually take. Today’s indoor working day has meant giving myself a crash course in glacial processes. The station is well equipped with books and papers on Stoglaciären, and though I have learnt a little about glaciers from doing my literature review last year, it’s nice to be able to apply the theory to actual glaciers. For the next few days I am hoping the snow melts as much as possible so I can help carry the experiment equipment up to the fieldsite and get Karen set up before returning to Aberystwyth to start a summer of lab work. There’s been a lot of waiting going on these past weeks: waiting for purchases to arrive, waiting to be able to pack, waiting to travel… Now I find myself in the absolutely stunning surroundings of Tarfala, complete with beautiful mountains and fantastic glaciers, waiting for the winter’s snow to melt away. Our first three days here were blessed with glorious weather, which made for a perfect helicopter ride in, and enabled us to get up to Storeglaciären without delay. Alas, the glacier is currently covered in snow from head to toe, which isn’t really ideal when you’re trying to study surface ice. Within the area that we were keen to set up our experiments, snow depth ranged from 60 – 120cm and there are three very distinct ice layers within this pack. There are clearly two ways around this situation: 1) The ideal: Wait and let nature take it’s course, or 2) cheat. Waiting can be a frustrating game, and waiting too long bites into extremely precious field time, so with little to loose, we quickly set about trying our hand at cheating. For two days, Aliyah and I dug until our hands blistered and our backs ached. The bottom 30cm of snow was water saturated, which is great for melt, but it adds a sting in the tail for shoveling just when you think your back can’t take anymore. Nevertheless, satisfied with our efforts, we dropped tools yesterday evening and headed home for a well deserved dinner and sauna. We chose to stop shoveling at a thick Feb 2017 ice layer so as to not disturb the glacier ice. We’ll let nature do the remaining hard work from here and will reassess the situation tomorrow after today’s rain has faded away. Hopefully either by nature, or by nurture, we’ll get to start our experiments soon. The cheating game: phase 1 complete… We have won this battle, but how about the war? It turns out it’s pretty hellish trying to pack for the Arctic during the UK’s hottest June day since 1976… not to mentioning in an office that lacks opening windows or air-con! Nevertheless, after several hours of to-ing and fro-ing around the buildings of Aberystwyth University, an ensemble of ideas of what to pack finally materialized into four large hold bags and my hand luggage. With thoughts of woolly socks and Primaloft jackets still making me wince, it was time to cram it all into my car and start my journey (north-) east. Tonight, I travel to Sheffield where I’ll be spending a few days working before meeting with PhD student Aliyah Debbonaire (@Gnarliyah) at Manchester Airport on Thursday and making our way towards Tarfala Research Station. 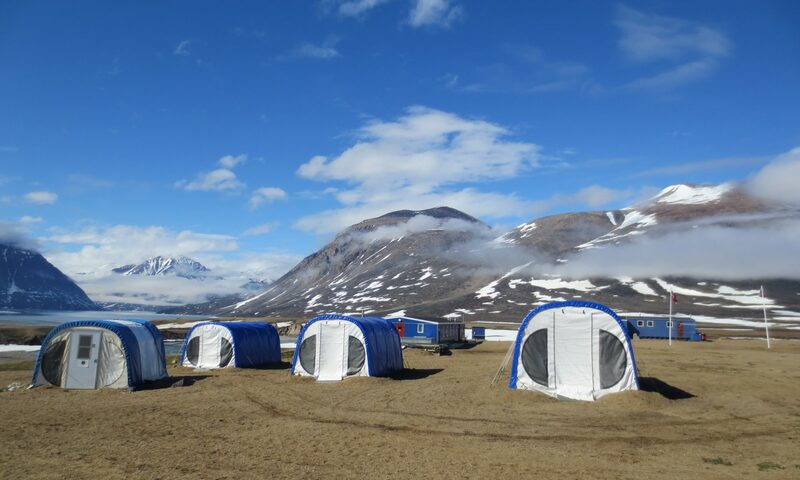 News from Torbjörn who manages the station is that they have been having “snow-mixed rain” with no signs of summer yet and there are “snowpatches are meter thick with bare ground between”. I’m hoping that summer kicks in fast over the next week or so, so that the Storglaciären’s surface becomes exposed and we can gain access to the biological life that survives on it soon. Fingers crossed!! ps just seen Tarfala Research Station‘s latest Facebook post and it looks like the snow melt might be on our side after all. Here is a snap from 2 days ago. While all of Storglaciären’s surface seems snow covered still (unlike the area circled in red on the neighboring glacier), I’d say we’re on track for exposed surfaces soon… I’m still keeping those fingers crossed though!